The film is about a witch who is 128 years old and that is very young for a witch. She absolutely wants to join the other witches in the witch dance on the Blocksberg, but she is too young and too nice. She helps kids from a village and that’s not good. But she wants to dance so desperately that she agrees to the other witches` order to learn seven thousand eighty-two spells and to be a good witch in the coming year. She has a friend which is a raven. He lives with her and he helps her a lot. Her aunt, the old and grumpy witch Rumpumpel checks whether she does everything correctly. But she puts her friends in danger. I like this film very much. You must see it. world war. I like the book very much. 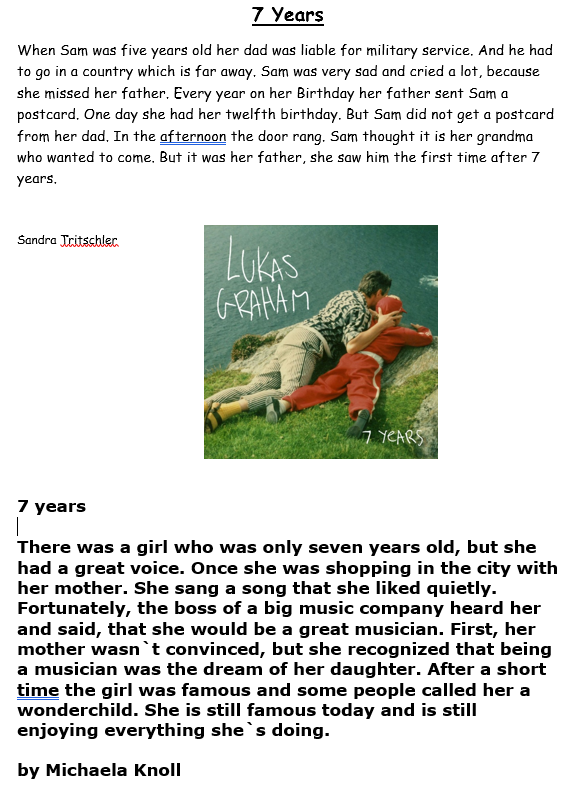 It´s about a boy, he is ten years old and lives in Freiburg. World War comes closer and the times are very bad. scary. I find good, that there are real scenes. Let´s go and read this exciting book now. I like the film. In this film there is a wild girl (Mika) and a wild horse. The girl has bad marks at school. Her friend lights the report and it flys onto the car of the teacher. The girl has to go to the grandma to a horse farm. Mika doesn`t like horses, but the horse Ostwind likes Mika. This is a cool film because I love horse. If you love horses too – go and watch the film! Riverdale is a very exciting series. It is a mix of romance and drama. It is a story about four best friends who want to find a murderer, who killed many people in the little town Riverdale. Strange things happen and the friendship gets broken. I like this series because it stays exciting from episode to episode. The actors play well. The location is very beautiful and the film is well made. Go and watch this series. I give it four stars. The story takes place in another world dominated by a powerful church called the Magnisterium. It’s an adventure, for family and fantasy. The author is Phillip Pullman and it was released in 2007. In a parallel world 12-years old Lyra Belaqua travels to the north with the mysterious Mrs. Caulter. In her luggage Lyra has a golden compass which always says the truth. During the trip, she hears about a pilot station doing experiments on children. When she realizes that Mrs Coulter is behind this program, Lyra flees. She meets the ice-bear Loren Byrnison and other companions and tries to free the children and to destroy the laboratory. For me the film is cool. It has a lot of action, fantasy and animals. Go and watch this film, it`s very cool. My film review about "the Grinch"
This story is about a green creature “the Grinch’’. He lives with his dog in Whoville, that`s a valley in the mountains. He hates Christmas more than anything else. That’s why he steals all Christmas things, the trees, the presents, everything! But in the end everything is fine again. This movie is a comedy for kids but also for parents or grandparents. The main character is the character of the Grinch, the actor is “Jim Carrey”. The old movie was relased in 2000. I like the old version more, because it’s more exciting than the new version of 2018.
a family with a son. But he isn’t the real son. the pursuer of his real father. But he doesn`t give it back. when they have the son. The father kills one of the pursuers. The location is nice and the actors are funny. I like the little love story in the film. I give the film 5 stars. 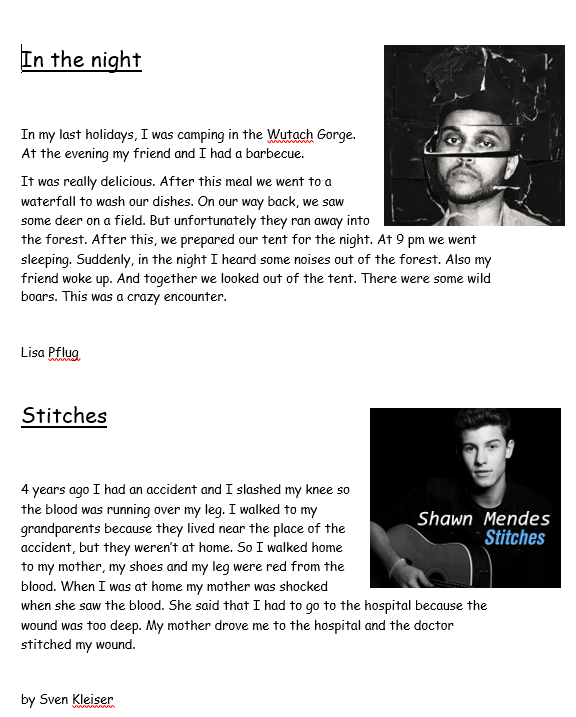 At the end of term the students of form 8a had some fun writing creative stories inspired by their classmates. The students started with headlines like “Sherlock Holmes meets Mrs Marple”, “an exciting day” or “a fairy tale” only and brainstormed for each story title in a gallery walk first. Then each group got one of the brainstorm worksheets and created a story around many of the words and ideas they had found on the paper. 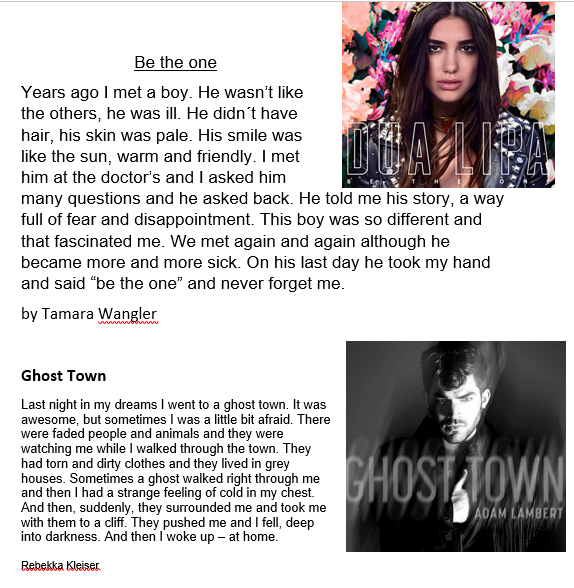 Written by Anika W., Laura P., Laura W.
On a foggy day a man goes for a walk in the woods. And then a scream and nobody has seen him afterwards. On a foggy day a man named Steve goes for a walk in the woods with his dog. And suddenly the dog pulls on his leash. The dog begins to run faster and faster and Steve is falling down. In front of his nose there's a bloody plastic bag and he screams scaredly. The dog comes back and sniffes at the plastic bag. Again he begins to run with his nose on the ground, because he has found a scent. Behind a big tree the dog stops and barks. Steve goes to the big tree and sees a big barbeque with many people. He is really happy and relieved. And nobody knows the true story of the man who screamed 5 days ago. Jake and his friends Sarah, Dan and Amy lived in Las Vegas. They won four tickets for a flight with a helicopter over to the Niagara Falls. So they went by car to Las Vegas Airport and flew by a private jet to Canada. When the friends were in Canada, they first went to the Niagara Falls and took photos of it. One hour later they went to the helicopter and flew. But then there came a hurricane so they crashed. Jake, Dan, Amy and Sarah were okay but the pilot died. The friends found themselves in a bear territory and saw about twenty bears. Then the friends run away. Then there came a hunter and shot out the bears. The friends hid behind trees. The bears run away. The hunter brought the friends to his home. Jake fell in love with the daughter of the hunter. Two years later they married in China. Everything had begun with the idea of Mr. Kist to record a fictitious movie trailer. It was May and we were in the process of reading the book “Among the Hidden” from Margaret Peterson Haddix in our English lessons. We started into the book by watching a movie trailer to the novel that was filmed by an American school class and this triggered the idea of doing an own version. We, the class 9a decided to do this and so we started to plan the project. We needed a complete new storybook and storyboard with all the important information to understand the context of the book. The trailer should not reveal too much and it should be not too long. Then we needed a location, food for the shooting day, a camera crew, actors and so on. So we divided the class into groups where everyone could bring in his talents at its best. The filming was done on our own in the English classroom and at a farm in Titisee, our neighboring village. Everything went surprisingly well on the shooting day and we could film everything that was needed. Then it was just a matter of time till the hole scenes were edited and cut together with the awesome music from Zack Hemsey. We hope we get his permission soon to make the movie available online. At this point it should be mentioned that we definitely don't want to make money with this movie or the ideas and work of other creators. It was a very funny school project and I could imagine doing something similar in the future again. We hope you liked this idea and the movie itself as much as we do. Genau genommen ist es eine Graphic Novel, das heißt, es ist wie ein Comic mit einzelnen Bildern und Sprechblasen. In diesem Fall hat P. Craig Russell die Bilder gezeichnet, genau passend zur Handlung des Buches. In dem Buch geht es um das Mädchen Coraline, das mit ihren Eltern in einem großen, alten Haus wohnt. Aber nicht allein. Zwei ältere Damen, die einmal Schauspielerinnen waren und ein alter, etwas komischer Mann, der einen Mäuse-Zirkus betreibt, wohnen ebenfalls darin. Nein, das wird nicht verraten, sonst wisst ihr ja schon alles. Am besten lest ihr das Buch einfach selbst und findet heraus, wie es Coraline ergeht. Als wir mit unserem Projekt angefangen haben, wussten wir noch nicht, wie viel Spaß und Freude auf uns zukommt. Allein das Buch wirkte schon sehr spannend und interessant, deshalb freuten sich alle darauf, die ersten Kapitel lesen zu können. In fast jeder Englisch-Stunde wurde ein Teil gelesen und dazu haben wir allein oder in Gruppen Aufgaben bearbeitet. Es wurde wirklich nie langweilig, auch wenn man alleine arbeiten musste. Sogar die Hausaufgaben haben Spaß gemacht, auch wenn das die meisten Schüler nie zugeben würden. Aber bei Coraline machen wir mal eine Ausnahme. Alle arbeiten wurden im Lesetagebuch abgeheftet, schließlich sollte das am Ende eine gute Note ergeben. Deshalb haben sich auch alle besonders viel Mühe gegeben. Als am Schluss die Ordner eingesammelt wurden, waren wir fast ein bisschen enttäuscht, wieder zum normalen Unterricht übergehen zu müssen, denn die Abwechslung, die ein Lesetagebuch in den Unterricht bringt, ist wirklich toll. Man kann so viel Neues entdecken und immer wieder neue Erfahrungen sammeln. 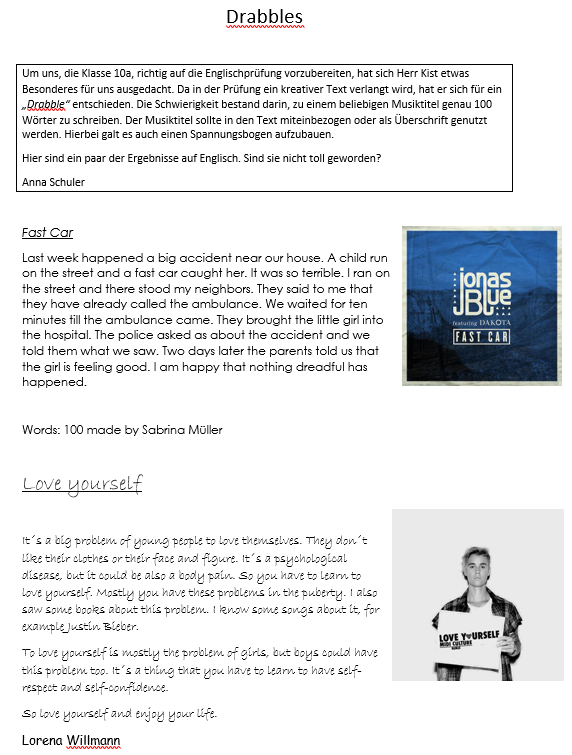 Außerdem kann man ein Lesetagebuch ganz individuell gestalten, jeder nach seinen eigenen Ideen. Und das haben wir auch gemacht: Jeder Ordner für sich war schön. Jeder hatte sein ganz persönliches Lesetagebuch und Herr Kist war sehr zufrieden mit uns. Das hat uns stolz gemacht. Schaut doch mal beim Schaukasten vor dem Physik-Saal im Erdgeschoss vorbei! Dort könnt ihr Arbeitsblätter, Texte, Zeichnungen oder die Schuhkartons unseres Projektes bewundern. Wenn ihr etwas über den Autor des Buches erfahren möchtet, dann könnt ihr ebenfalls vorbeischauen, denn wir haben auch Informationen über ihn gesammelt. Und wenn ihr noch mehr über Coraline erfahren wollt, oder das Buch gerne lesen würdet, dann fragt doch einfach mal die jetzige Klasse 9a. Die kann euch bestimmt etwas über das mutige Mädchen, das hinter einer Tür eine geheime, gruselige Welt entdeckt, erzählen.